With our recent return to Northern California, a celebration seemed necessary! In January we hosted a special evening at The Riddler in San Francisco with Frances Austen to welcome the FA Collection II and The Essentialist Collection's arrival to the Bay Area. Read more about the evening covered by Haute Living and enjoy a few of the photos below. 3) Guests enjoyed champagne & caviar while shopping! 4) Margaret & I are old and dear friends from UCLA. I'm so grateful to have her along during this journey of entrepreneurship and motherhood. 6) Frances Austen cashmere with hangtags printed by me! 7) Invitations were mailed to guests in advance... created by me, of course! More details about the project in our custom gallery. And of course... photos from Instagram stories. a) Frances Austen's Bow Back Blouse. My styling was inspired by Frances Austen's Collection II photoshoot. I had to copy the look! Margaret made sure my "Yves Saint Laurent" bow was fresh all evening. b) A reunion with dear friends and old roommates (Jackie & Lauren) who live in SF joined the celebration! c) High School classmate and talented friend (who also shot our wedding), Eileen Roche made it to the event too <3. I'm so happy to be up north with closer access to these faces. With the exception of the Instagram Stories & Invitation photos, all images are compliments of New Rev Media. (Another serendipitous reunion... when the photographer walked in, I was shocked to see Pierce Larick who is also from my hometown. Such a special surprise to the evening.) Special thanks to Margaret, Frances Austen, Emily Martin Events, The Riddler, and Di Moda PR for creating an extraordinary evening. I'm admittedly taking the entire month of January to acclimate to 2018. This year more than ever the joke, "New Year, New Me" rings very true. At the end of 2017 our family moved out of Los Angeles and back home to Northern California. There is nothing like having a baby to make you quickly realize how much you want and need to have family close by. The excitement and relief to be near family is strong, but I still miss my LA friends dearly - especially the women of WE. Anthony and I are working on a special project that I hope to share more about soon. In the mean time, I've moved my studio up north and we are carrying on business as usual - just at a slower tempo. One part I'm most excited about is connecting with creatives and entrepreneurs in the Bay Area and other parts of Northern California! There are people I've corresponded with only over Instagram for years... and I know this move will make it possible for us to actually meet in person soon. As I write this I also feel very aware that there are probably a handful of people in LA who don't know we left, and a lot of people at home who don't yet know we are here! (Just wait for it - I'm probably going to see you at the grocery store soon!) This change happened fairly quick and I'm sorry that we didn't get to see everyone we love before leaving. Next week I'm visiting San Francisco for the first time since 2013! 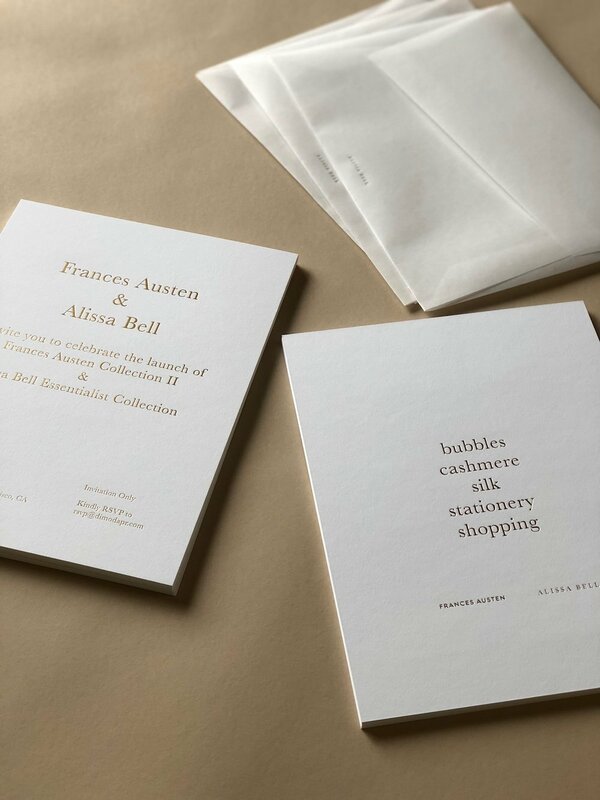 Frances Austen and Alissa Bell are hosting a private event to celebrate the launch of FA's Collection II and the Essentialist Collection's launch in the Bay Area. If you're in San Francisco and want details to the event, just send me an email or direct message on Instagram. Don't forget to include a recommendation for what we should see, eat, and visit while in the city. So many reasons to celebrate next week with Frances Austen! I hope your 2018 is off to a fresh and clear start! I’ve actually been feeling a little bit nervous about adding to the Black Friday shopping noise. I don’t want to annoy, get deleted, or feel a loss of brand value by joining in. But ‒ I’m trying to remember that as a consumer myself I get so excited when my favorite brands offer something special during this weekend. It reminds me they are real people working hard, getting creative, and trying to provide for their families. So here I am jumping in and offering my first sale of The Essentialist Collection! Thursday thru Monday the entire Collection will be 20% off with code ESSENTIAL20. Thank you to everyone reading this blog post. Your support and attention means the world to me. I get to provide paper and stationery for the moments that matter in your lives... and it is a privilege. Thanks for making that possible.